Ancient city of Jingzhou is what is now Jiangling District of Jingzhou City. It is situated in the middle reaches of the Yangtze River, a strategic place of military importance since ancient times. It is a famous cultural city in south China. Palaces for the king of the State of Chu were built here during the Spring and Autumn and Warring States periods. The city was said to be built with earth by Guan Yu in the Three Kingdoms Period. Bricks were used in the Southern Song Dynasty. The present city walls were rebuilt in 1646: about 9 m high, 10 m thick and 9. 3 km in perimeter. The city walls, city gates, enemy broadcasting stations and battlements have been maintained well. 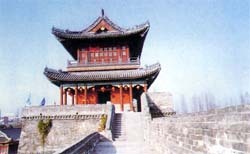 On top of the majestic city gates, towers are built, but most have been damaged or rebuilt, only leaving the Chaozong Tower which was rebuilt in 1838 erecting on the Gongji Gate today.